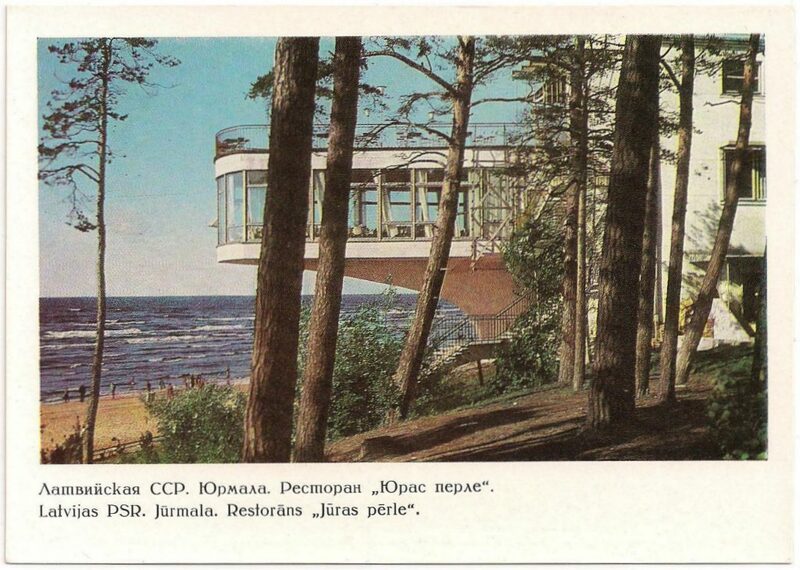 In the Soviet period Rīgas Jūrmala is still a popular seaside resort. 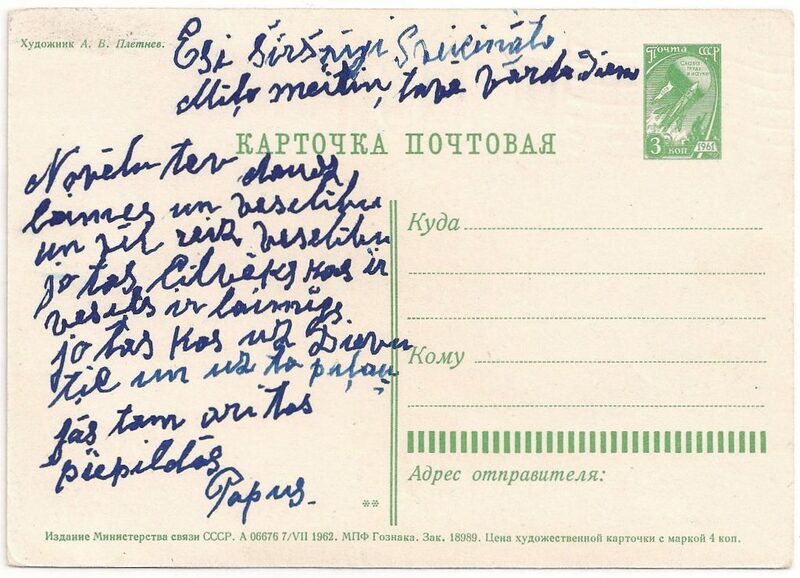 On this card -a postal stationary – the picture gives an impression of Rīgas Jūrmala. On the address side of this card is -bilingual- mentioned: ‘LATVIJAS PSR. RĪGAS JŪRMALA’ . Also the художник (=artist) is mentioned here. On the lower edge we see the printing data. 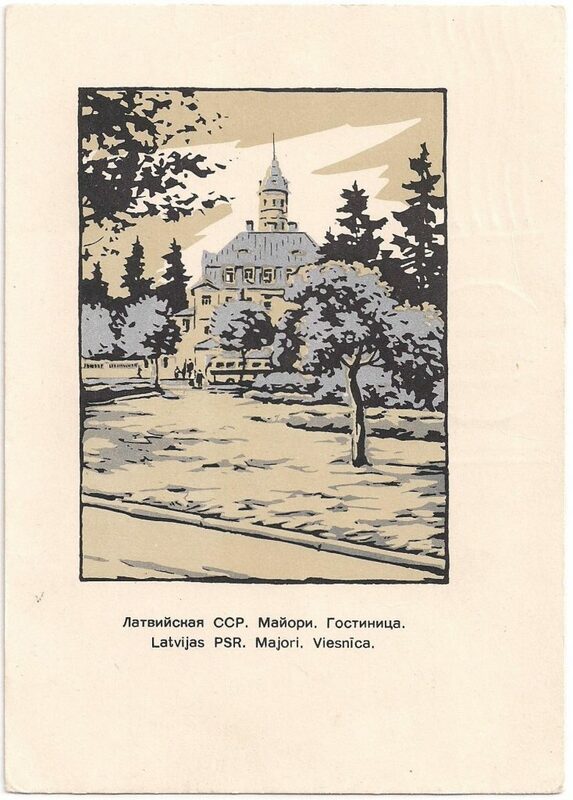 The card is issued in 1961 and printed in the МПФ ГОЗНАКА, short for МОСКОВСКОЙ [MOSKOVSKOI] ПЕЧАТЉОЙ [PECHATNOI] ФАБРИКЕ [FABRIKE] ГОЗНАКА [GOSZNAKA], Moscow Printing Factory Goznak. Number 16084 is the number of the ЗАКAЗ [ZAKAZ], order. 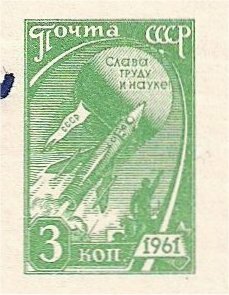 As imprinted stamp is used a stamp of the 10th set permanent franking stamps, with the year 1961: a starting rocket. 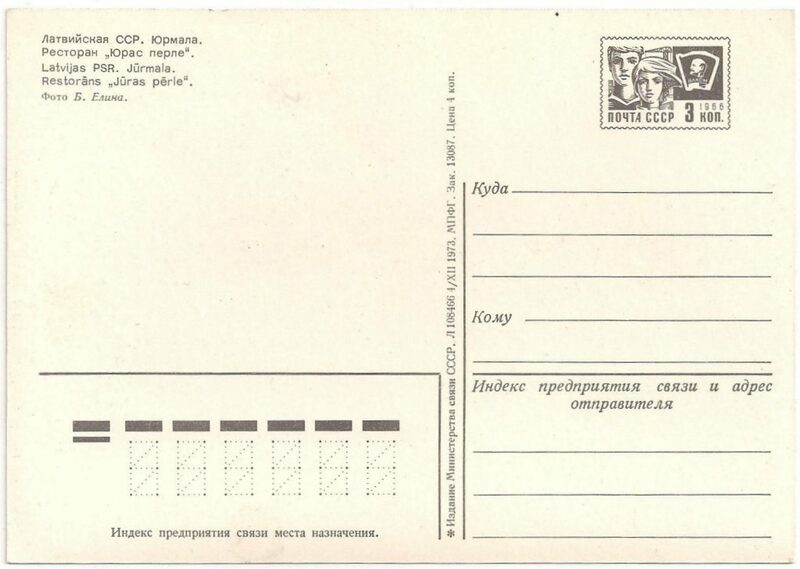 This postal stationary with МПФ ГОЗНАКА and imprinted stamp Type II is in the Michel P 285, subnummer III (only year, not a number starting with A in the printing data.). 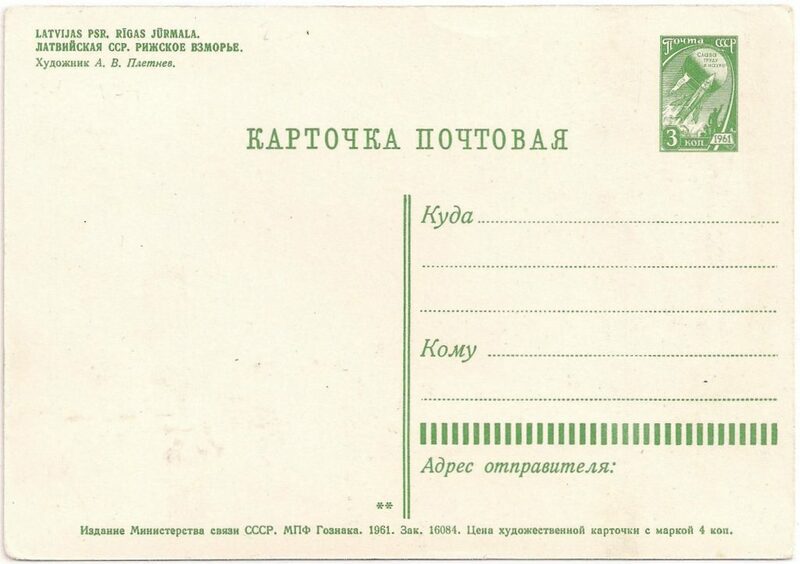 After the printing data on the lower edge is mentioned: ЦЕГА ХУДОЖЕСТВЕННОЙ КАРТЧКИ Р МАРКОЙ, Price of the artistic card with imprinted stamp. And that was 4 kopecks. In 1946 Rīgas Jūrmala is added as 7th district to Riga. Ķemeri and Sloka were -and continued- autonomous. In 1959 Jūrmala became a city, including Ķemeri and Sloka. 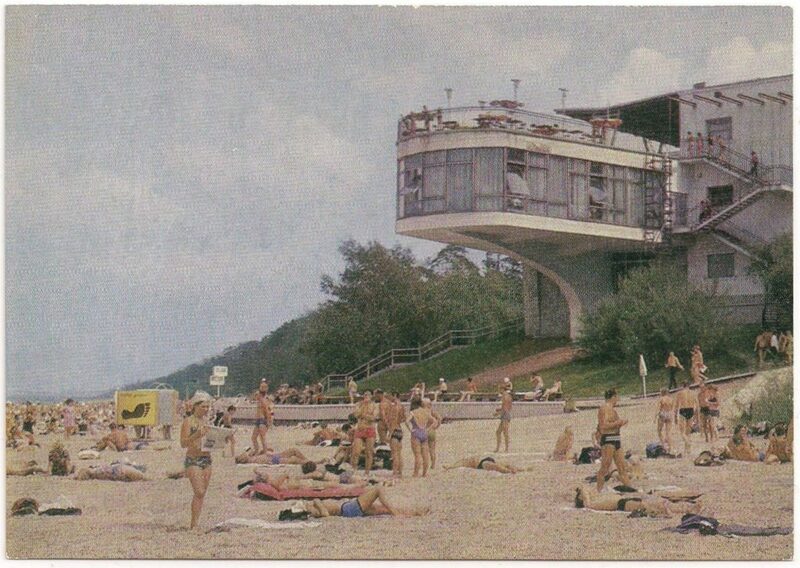 Rīgas Jūrmala was long been associated with health resorts, sanatoriums and spas. 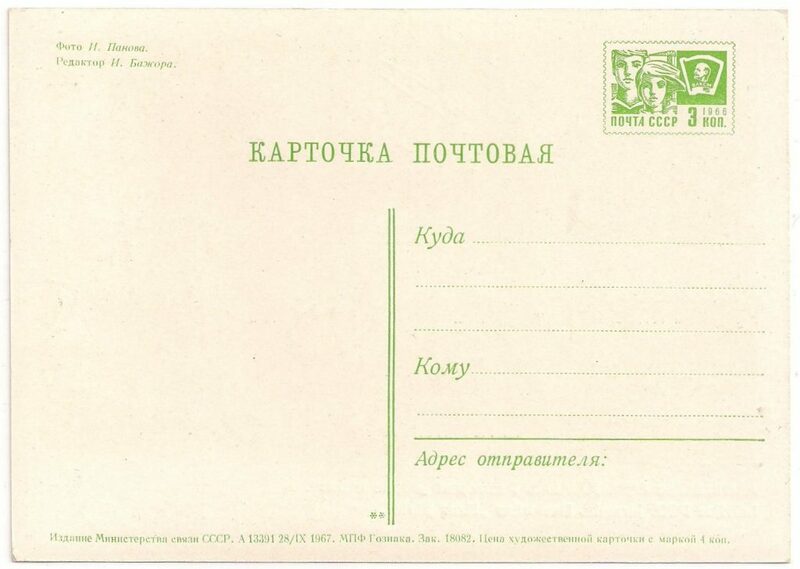 On this postalstationary is mentioned a sanatorium in Bulduri. 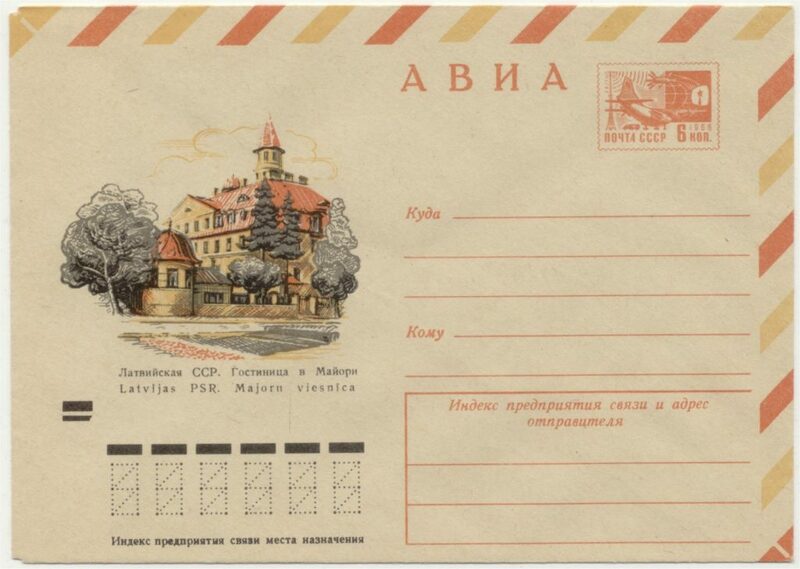 On this postal stationary, issued May 3, 1962, is shown a picture of the sanatorium Cina in Bulduri. On the backside of the postal stationary are the printing data indicated. “Juras Perle”, Sea Pearl, was a famous restaurant on the beach of Bulduri. It was build in 1965, the architect was Josifs Goldenbergs. On the first floor was also a nigh-bar. Unfortunately it burned down in 1991, in 2001 the remnants were removed. On this card -postal stationary- you see a nice picture of this building. As imprinted stamp is used a stamp of the 11th set permanent franking stamps, with the year 1966: a young boy and girl (3 kop.). On this card is used type I as imprinted stamp, with a imprinted ‘perforation’. On the shouilder is clearly a greater -like a triangle – break in the shading. On the next card below, issued December 4, 1973, is used type II as imprinted stamp. This card is without field for postal code and according the schema in HBG 60 is a further division the order of the indication КАРТОЧКА ПОЧТОВАЯ [KARTOCHKA POCHTOVAYA] (P 321-339) or reverse order ПОЧТОВАЯ КАРТОЧКА (P341-354).The card here is classified in the first group. The card has a imprinted perforation with stamp type I, printing house МПФ: P 335. The card is issued September 28, 1967. This card is issued December 4, 1973. As imprinted stamp is also used the stamp of the 11th set permanent franking stamps, with the year 1966: a young boy and girl. On this card – is used stamp type II: offset: shading also a break, but only 0,5 mm, with imprinted perforation. 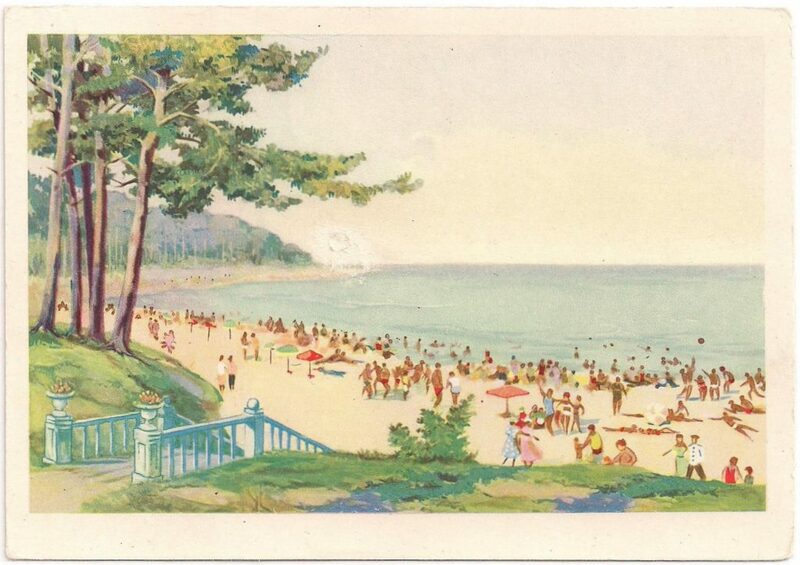 On this card we see the field for postal code: Michel P360-397. There are different types postal code fields. Above the six input field are a row bars and before these a start-indication. Here field-type III: the two bars of the start-indication are on the same level as the other bars. IIIB: same text, only thin points in the input fields, mostly diagonals of four points. Here clearly Type IIIA on this card: thicker corner points in the input fields. This card with field for postal code type IIIA belongs according the schema in HBG 60 (p. 22) to the cards P 378-P397. Between the left and the right side is a breakline: the lines of the address and sender are separated from the breakline. So the card must be classified between P 378-386, the imprinted stamp type II, offset, so P379-386. The text under the input-fields of the postal code is placed something to the left (not right underneath): so between P 379-382. The price is 4 kopecks: P 379 or 381. Both have МПФГ as printing house and the month in roman numerals. The difference: P382 has in the printing details © and year. This card has not the indication © and year: P 379. 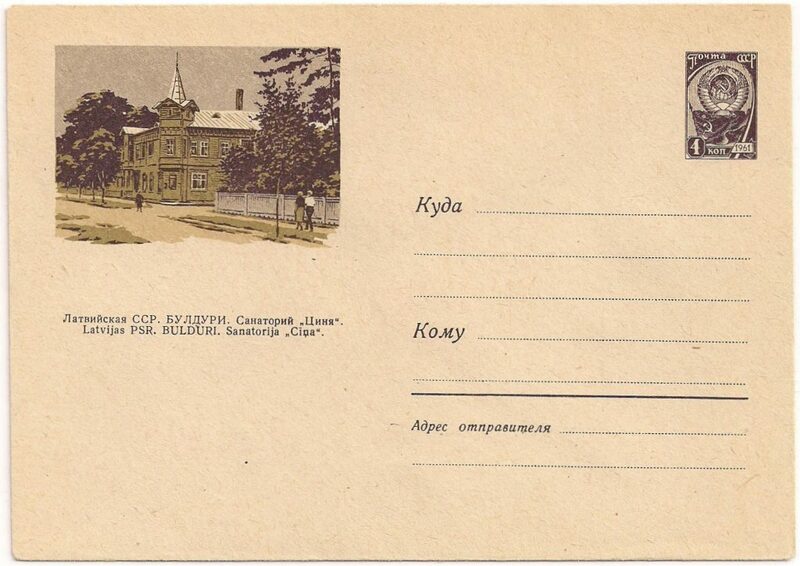 Majori, with a railwaystation 24 km from Riga, was also in the Sovjet period center of the spa life, so there are many cards and covers -postal stationery- with pictures of this place. Postal stationary, issued July 7, 1962. The card is issued July 7, 1962, and printed in the МПФ ГОЗНАКА, short for МОСКОВСК ОЙ [MOSKOVSKOI] ПЕЧАТЉОЙ [PECHATNOI] ФАБРИКЕ [FABRIKE] ГОЗНАКА [GOSZNAKA], Moscow Printing Factory Goznak. Number 18989 is the number of the ЗАК [ZAKAZ], order. Cards with this indication of printing house, imprinted stamp type II, offset, color on addres-side green/white: must be Michel P 285. A scheme of the cards with the imprinted stamp of the 10th set permanent franking stamps, with the year 1961 (a starting rocket): in the article ‘Postwaardestukken uit de sovjetperiode : ansichtkaarten (HBG 60, p 16). The number A 06676 is the publication-number. In the sixties, this number was preceded by A, later by the character Л. The printing data in one line below, start -as usual- with: ИЗДАНИЕ МИНИСТЕРСТВА СВЯЗИ CCCP, publication of the ministry of communication of the USSR, and then the publication-number. The hotel is also depicted on postal stationery, covers with imprinted stamp. Here a postal stationary, issued 1/II-72, Februari 1, 1972. Postal stationary,issued February 1, 1972. Of course it is nice to stay in the famous hotel “Majori” and sent a postal stationary with this hotel. This hotel was built in 1925 under the guidance of the architect A. Medlinger in ‘Art Nouveau’stijl (or “historical-me’ style). In the crisis of 1932, the hotel was to be auctioned. The valuable interior was partly moved to Sigulda castle. In 1991 the hotel was renovated. It is shown on several postal stationery: a cover issued 30-12-1974, another isued 13-2-1986.